In the wrap-up stage, get the player to say exactly what the action plan is. 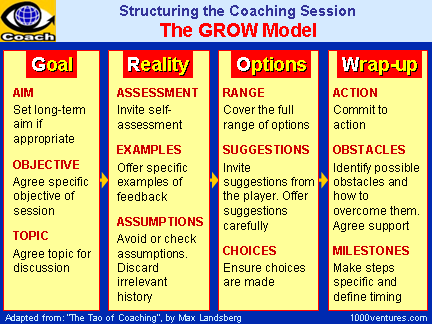 The GROW (Goal, Reality, Options, Wrap-up) model is one of the most common → coaching tools. It enables the coach to structure a coaching conversation and deliver a meaningful result. The discussion should start with defining the topic in order to understand what specifically the player wants to talk about, what territory you are in, the scale of the problem, the importance and emotional significance of the topic to the player and the player’s long-term → vision of goal for the topic. Step 1: Goal. Coach and player agree on a specific aim, objective and topic for the discussion. This goal is not the longer-term objective that the player has. This desired outcome is to be achieved within the limits of the discussion. Step 1: Goal. Coach and player identify and agree on a number of clear and achievable goals (outcomes) for the discussion. This goal is not the longer-term objective that the player has. This desired outcome is to be achieved within the limits of the discussion. Step 2: Reality. Both coach and player invite self-assessment and offer specific examples to illustrate their points and achieve the most accurate picture of the topic possible. Step 3: Options. In the options stage the coach’s intention is to draw out a list of what all that is possible for the player to do without judgment and evaluation. Coach elicits suggestions from the player by asking effective questions and guides him/her towards making the right choices. Step 4: Wrap-up. In this stage the coach’s intention is to gain commitment to action. Coach and player select the most appropriate options, commit to action, define the action plan, the next steps and a timeframe for their objectives and identify how to overcome obstacles.